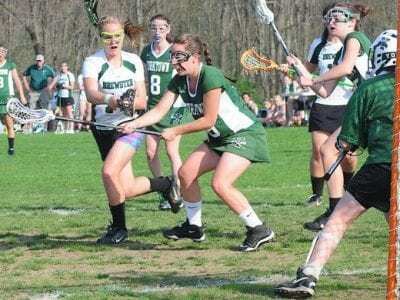 BREWSTER—Eight Brewster players reached the scoring column last Thursday, as the Brewster High lacrosse team rolled over Fox Lane, 9-2 in a game played at Brewster High. The Bears also slipped past Horace Greeley, 8-7, the prior Tuesday … Please login below or purchase a subscription to the Putnam County Courier to access this content. Brewster’s Lindsay Biondi fires on Yorktown keeper in last Thursday’s loss to the Cornhuskers. BREWSTER—Lindsay Biondi scored seven goals and Megan Yarusso added two goals and two assists, but it wasn’t enough, as the Brewster… Please login below or purchase a subscription to the Putnam County Courier to access this content. CARMEL—Sooner or later, the Carmel High baseball team is going to have to throw someone other than Ian Anderson out there, but for now Anderson has been The Man on the mound for the Rams – winning all three of Carmel’s games so far… Please login below or purchase a subscription to the Putnam County Courier to access this content. PUTNAM VALLEY—The Putnam Valley high softball team (1-2) has been having some trouble hitting the ball early in the season. The Tiger got their first win of the season against Lakeland on Thursday in a close but crazy game where they had only … Please login below or purchase a subscription to the Putnam County Courier to access this content. MAHOPAC—The two games played last week by the Mahopac High baseball team could not have been any more different. The Indians (1-2) followed Wednesday’s dramatic walk-off win against Roy C. Ketcham High with a blowout loss to John Jay East Fish… Please login below or purchase a subscription to the Putnam County Courier to access this content. MAHOPAC—After dropping their first two games of the season, the Mahopac High boys lacrosse team picked up two non-league wins. The Indians (2-2) opened their week with a 13-10 win over Horace Greeley, and followed that up with an 11-9 come-fro… Please login below or purchase a subscription to the Putnam County Courier to access this content. SOMERS—After an ugly loss to Mahopac, the John F. Kennedy Catholic high softball team (1-2) squandered its only chance to bounce back before the league schedule started by losing to Lakeland at home on Friday. When Monday rolled around, so did… Please login below or purchase a subscription to the Putnam County Courier to access this content. BREWSTER—Adriel Barnes and Mike Blank both homered, but the Bears still fell short, as the Brewster High baseball team dropped an 8-3 decision to Ossining in a non-league game played last Friday at Ossining. Brewster also settled for a 5-5 t… Please login below or purchase a subscription to the Putnam County Courier to access this content. CARMEL—In two games Carmel High senior Monica Schult has pitched 15 innings and allowed just four runs, but unfortunately for her and the rest of the Rams softball team, they lost both times. The Rams (0-2) followed Monday’s 1-0 loss at Haldan… Please login below or purchase a subscription to the Putnam County Courier to access this content.